'Indigenous cinema' will be celebrated in Toronto at the 10th "imagineNATIVE Film + Media Arts Festival", Wednesday, October 14th to Sunday, October 18th, 2009, showcasing global aboriginal filmmakers and media artists, with more than 125 works of innovation in film, video, radio and new media. "The celebration of imagineNATIVE’s 10th anniversary offers an important occasion to reflect on the accomplishments of the last 10 years and the exciting opportunities ahead of us," said Executive Director Kerry Swanson. "In 10 years we have seen an incredible explosion of growth in Indigenous-produced film and media art and, as a result, a surge of interest and recognition for the unique and groundbreaking work shown at the festival." 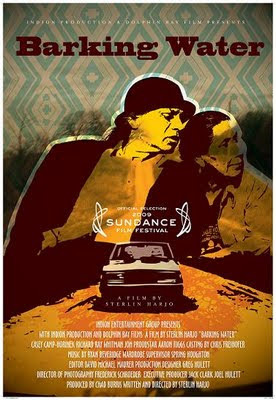 "The films programmed this year," said Director of Programming Michelle Latimer, "speak to the contemporary experience and reflect the fact that today's Indigenous filmmakers are reclaiming the medium of film and transforming the world-view of Indigenous people by voicing our contemporary stories from the inside out." 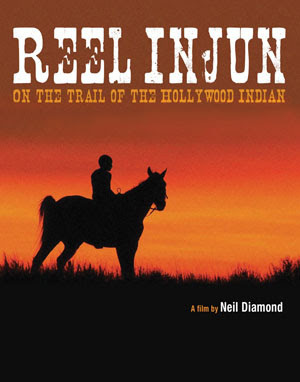 The fest opens with the Canadian feature doc "Reel Injun", a look at stereotypes of the 'cowboy and Indians' era, with classic movie clips and interviews with Robbie Robertson, Clint Eastwood, Adam Beach, Graham Greene, John Trudell and Jim Jarmusch, accompanied by the Canadian short "Tungijuq", about Inuit hunting traditions and a woman’s transformative journey, starring 'throat singer' Tanya Taqaq and Cannes-award winning filmmaker Zacharias Kunuk, director of "Atanarjuat: The Fast Runner". In a Fest world premiere, filmmaker/writer/activist Sarah Roque’s "Six Miles Deep" offers a look at the women who stood behind the lines during the 2006 Caledonia/Six Nations land claim dispute, celebrating clan mothers from past to present, while giving voice to the hopes of a community. Other films include the feature doc "Jackpot", directed by Alan Black and produced by Michelle Latimer, set in a Toronto bingo hall. Documentarian Alanis Obamsawin will screen "Professor Norman Cornett – 'Since When Do We Divorce The Right Answer From An Honest Answer? '", setting her sights on "...academia and its imprint on tomorrow’s attitudes via young minds..."
Obamsawin has made more than 20 docs about Aboriginal issues, receiving the Governor General’s Award and the Order of Canada. Six shorts programs will be on view including a first-time animation category, two dramatic programs, Youth, Experimental, The Witching Hour (late night films) and Embargo Collective, a two-year collaboration of seven boundary-pushing artists. Special Programs includes an illustrated lecture curated by Dana Claxton with an accompanying essay published by the festival’s partners Vtape; curator Cheryl L’Hirondelle reflects on the roots of Indigenous new media art with the exhibit 'Codetalkers of the Digital Divide', presented in partnership with A Space Gallery. A New Media Mash Up offers a live collaboration between Tanya Tagaq and video artist Bear Witness, Thursday October 15 at The Music Gallery. Inuit artists featured throughout the festival will also celebrate the 50th anniversary of Cape Dorset’s Kinngait Studios with a screening/gallery tour at the Art Gallery of Ontario with curator Gerald McMaster. The world’s newest democracy, the country of Nepal, will be the feature of the International Spotlight of original film voices. THE BEAT program returns this year with Nunavut alt-rocker Lucie Idlout, singer-songwriter George Leach and Cree slide-guitarist Jason Burnstick @ The Hard Rock Cafe. The imagineNATIVE closing night feature is the Canadian premiere of "Barking Water", a new drama by Sterlin "Four Sheets To The Wind" Harjo, preceded by the world premiere of Adam Garnet Jones’ "Wave a Red Flag".